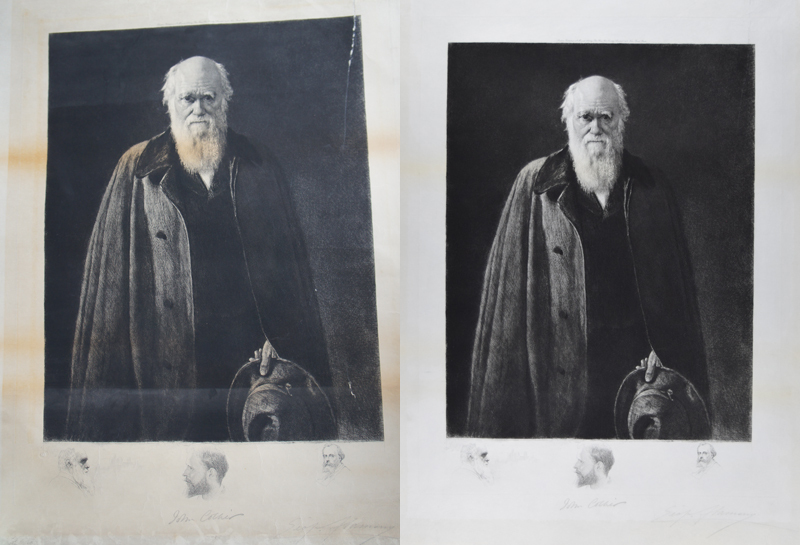 The etching by Léopold Flameng (1831-1911) is taken from the second of two portraits of Darwin painted by John Collier (1850-1934). The first, in watercolour on canvas, was commissioned by the Linnean Society in 1881, but Darwin's friends and family did not like it. They urged Collier to try again, which he did - in oil this time - in 1883, the year after Darwin died. The Darwin family approved of this second portrait, which now hangs in the National Portrait Gallery. For Darwin's son, Francis, "this portrait represents my father...in the loose cloak so familiar to those who knew him and with his slouch hat in his hand. Many of those who knew his face intimately think that Mr Collier's 1883 picture is the best of the portraits. Collier's 1883 portrait was engraved by Flameng in the same year, for an initial print run of 500 for the Fine Art Society. The Department of Zoology acquired a very unusual edition of this engraving, with remarques - sketches - of Darwin, Collier and Flameng, and the signatures of Collier and Flameng, in the bottom margin. It is possible that this print is unique to the Department. The version held by the National Portrait Gallery does not have the added remarques. This engraving must have hung in the Department for many years, but we imagine that at some point it fell, breaking the glass and the frame, and causing some damage to the print. It was then rolled up and stored in a cardboard tube in the Balfour Library Rare Books Store, where it was discovered early in 2017 by the Senior Library Assistant, Jane Acred. The etching was put on display during the Zoology Department Alumni Day in 2017 and was seen by the 1971-72 Part II Zoology Year group. They decided to club together to provide a donation that would enable the etching's restoration, which has been carried out by Museum Conservation Services Ltd based at the Imperial War Museum, Duxford, and is now almost complete. The fully restored etching will be part of the Art Trail during the Zoology Alumni Day on Saturday September 15th 2018.